Italian Starters There are 16 products to choose from. 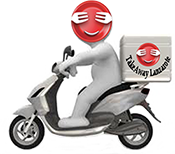 Takeaway Lanzarote - Restaurants Playa Blanca Fresh cheese , eggplant and bacon rolls. Takeaway Lanzarote - Restaurants Playa Blanca Squids with dried tomatoes , garlic , rocket , white vine and spicy chilli. Takeaway Lanzarote - Restaurants Playa Blanca Octopus a -la vinaigrette. Takeaway Lanzarote - Restaurants Playa Blanca Shrimps with garlic. Takeaway Lanzarote - Restaurants Playa Blanca Goat cheese with roasted pine nuts.